Powerful pyramids, Ou Chen, assistant professor of chemistry, holds a mock-up of the tetrahedral quantum dot building blocks used to create macro-scale superstructures. Brown University researchers have discovered a new type of quasicrystal, a class of materials whose existence was thought to be impossible until the 1980s. The strange class of materials known as quasicrystals has a new member. In a paper published on Thursday, Dec. 20, in Science, researchers from Brown University describe a quasicrystalline superlattice that self-assembles from a single type of nanoparticle building blocks. This is the first definitive observation of a quasicrystalline superlattice formed from a single component, the researchers say. The discovery provides new insight into how these strange crystal-like structures can emerge. Quasicrystal materials were first discovered in the 1980s by the chemist Dan Shechtman, who in 2011 was awarded the Nobel Prize for the discovery. Unlike crystals, which consist of ordered patterns that repeat, quasicrystals are ordered but their patterns don’t repeat. Quasicrystals also have symmetries that aren’t possible in traditional crystals. Normal crystals, for example, can have three-fold symmetries that emerge from repeating triangles or four-fold symmetry from repeating cubes. Two- and six-fold symmetries are also possible. But quasicrystals can have exotic five-, 10- or 12-fold symmetries, all of which are “forbidden” in normal crystals. The first quasicrystalline materials discovered were metal alloys, usually aluminum with one or more other metals. So far, these materials have found use as non-stick coatings for frying pans and anti-corrosive coatings for surgical equipment. But there’s been much interest in making new types of quasicrystal materials — including materials made from self-assembling nanoparticles. Chen and his colleagues hadn’t originally set out to research quasicrystals. Much of Chen’s work has been about bridging the gap between the nanoscale and macroscale worlds by building superstructures out of nanoparticle building blocks. About two years ago, he designed a new type of nanoparticle building block — a tetrahedral (pyramid-shaped) quantum dot. Whereas most research on building structures from nanoparticles has been done with spherical particles, Chen’s tetrahedra can pack more tightly and potentially form more complex and robust structures. Another key feature of Chen’s particles is that they’re anisotropic, meaning they have different properties depending upon their orientation relative to each other. One face of each pyramid particle has a different ligand (a bonding agent) than all other faces. Faces with like ligands tend to bond with each other when the particles assemble themselves into larger structures. That directed bonding makes for more interesting and complex structures compared with particles lacking anisotropy. In research published recently in the journal Nature, Chen and his team demonstrated one of the most complex superstructures created to date from nanoparticle building blocks. In that work, the superstructures were assembled while the particles interacted with a solid substrate. For this latest work, Chen and his colleagues wanted to see what kind of structures the particles would make when assembled on top of a liquid surface, which gives the particles more degrees of freedom when assembling themselves. The team was shocked to find that the resulting structure was actually a quasicrystalline lattice. Using transmission electron microscopy, the researchers showed the particles assembled into discrete decagons (10-sided polygons), which stitched themselves together to form a quasicrystal lattice with 10-fold rotational symmetry. That 10-fold symmetry, forbidden in regular crystals, was a telltale sign of a quasicrystalline structure. The researchers were also able to divine the “rules” by which their structure formed. While decagons are the primary units of the structure, they are not — and cannot be — the only units in the structure. Forming a quasicrystal is a little like tiling a floor. The tiles have to fit together in a way that covers the entire floor without leaving any gaps. That can’t be done using only decagons because there’s no way to fit them together that doesn’t leave gaps. Other shapes are needed to fill the holes. The same goes for this new quasicrystal structure — they require secondary “tiles” that can fill the gaps between decagons. The researchers found that what enabled their structure to work is that the decagons have flexible edges. When necessary, one or more of their points could be flattened out. By doing that, they could morph into polygons with nine, eight, seven, six or five sides — whatever was required to fill the space between decagons. The researchers showed how the nanoparticle decagons flexed their edges to in order to fit together in a quasicrystalline lattice. From that observation, the researchers were able to develop a new rule for forming quasicrystals that they call the “flexible polygon tiling rule.” That rule, Chen says, will be useful in continued study of the relatively new area of quasicrystals. “We think this work can inform research in material science, chemistry, mathematics and even art and design,” Chen said. Nagaoka’s and Chen’s co-authors on the paper were Hua Zhu and Dennis Eggert. Andrew Peterson. No photo credit. With a new grant from the U.S. Department of Energy, a Brown University-led research team will use machine learning to speed up atom-level simulations of chemical reactions and the properties of materials. “Simulations provide insights into materials and chemical processes that we can’t readily get from experiments,” said Andrew Peterson, an associate professor in Brown’s School of Engineering who will lead the work. The grant provides $3.5 million dollars for the work over four years. Peterson will work with two Brown colleagues — Franklin Goldsmith, assistant professor of engineering, and Brenda Rubenstein, assistant professor of chemistry — as well as researchers from Carnegie Mellon, Georgia Tech and MIT. The idea behind the work is that different simulations often have the same sets of calculations underlying them. Peterson and his colleagues aim to use machine learning to find those underlying similarities and fast-forward through them. The team will focus their work initially on simulations of electrocatalysis — the kinds of chemical reactions that are important in devices like fuel cells and batteries. These are complex, often multi-step reactions that are fertile ground for simulation-driven research, Peterson says. Atomic-scale simulations have demonstrated usefulness in Peterson’s own work in the design of new catalysts. In a recent example, Peterson worked with Brown chemist Shouheng Sun on a gold nanoparticle catalyst that can perform a reaction necessary for converting carbon dioxide into useful forms of carbon. Peterson’s simulations showed it was the sharp edges of the oddly shaped catalyst that were particularly active for the desired reaction. The researchers will use a software package that Peterson’s research group developed previously as a starting point. The software, called AMP (Atomistic Machine-learning Package) is open-source and already widely used in the simulation community, Peterson says. 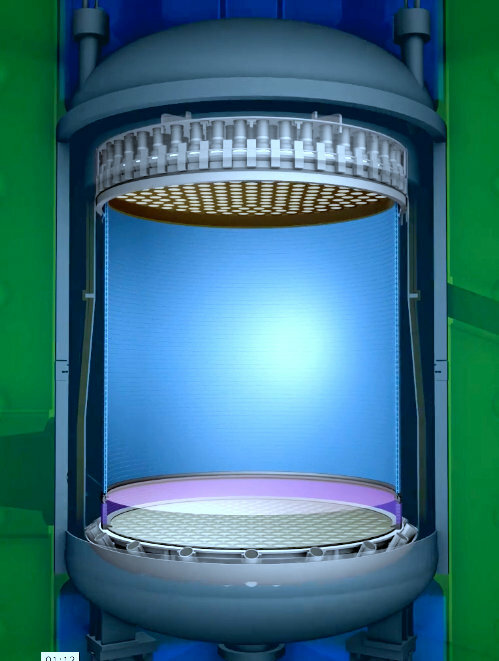 The Department of Energy grant will bring atomic-scale simulations — and the insights they produce — to bear on ever larger and more complex simulations. And while the work under the grant will focus on electrocatalysis, the tools the team develops should be widely applicable to other types of material and chemical simulations. Peterson is hopeful that the investment that the federal government is making in machine learning will be repaid by making better use of valuable computing resources. I’m also interested in the research that takes CO2 out of the atmosphere and turns it into just about anything else! 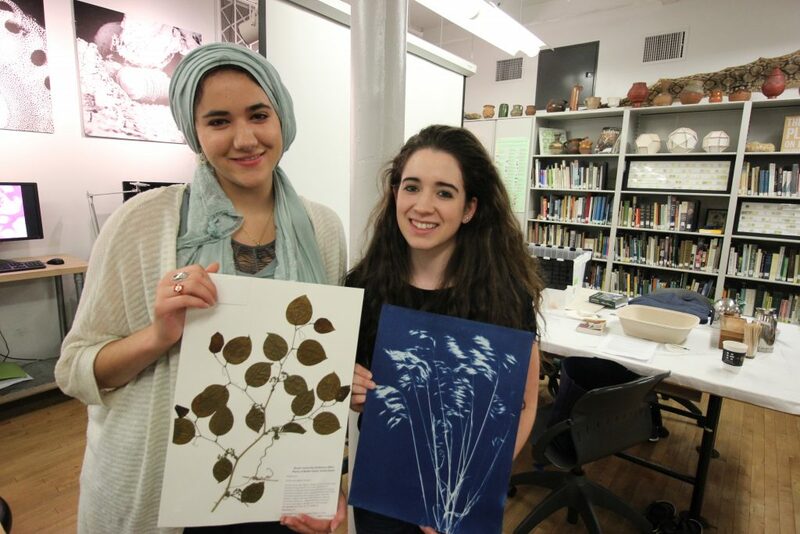 Nadia Lahlaf and Shannon Kingsley show the plant pressing and visuals they produced during the SURF program this summer at RISD’s Edna Lawrence Nature Lab. When Shannon Kingsley and Nadia Lahlaf first arrived at the Rhode Island School of Design’s Nature Lab in May, their goal was clear: produce a tangible product highlighting how climate change has affected plant life in Rhode Island’s salt marshes since the 1950s. Getting there, however, was a road left wide-open by mentors Dr. Timothy Whitfeld, assistant professor of Ecology & Evolutionary Biology at Brown, and the Nature Lab’s Jennifer Bissonnette and Lucia Monge. Kingsley, a sophomore studying English and Ethnobotany at Brown, and Lahlaf some days collected plant specimens from salt marshes at Tillinghast Place, a RISD satellite campus located alongside the Providence River. On others, they were examining plant species at Brown’s Herbarium or pressing plant leaves and taking highly detailed images with the Nature Lab’s “macro pod,” a camera which takes nearly 65 images of an item over time and compresses them into one to create the highest resolution possible. 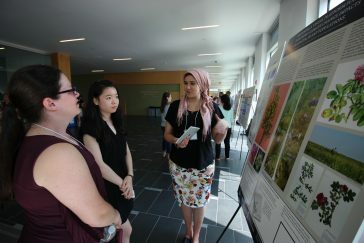 After about six weeks, the SURF students had to decide upon the medium through which they would showcase their research: an illustrated book detailing specific plant species and how they had been impacted by climate changes in Narragansett Bay. Nadia Lahlaf, a dual degree student in Computer Science and Illustration from Brown and RISD, explains their project at the 11th annual SURF Conference on July 27. Both SURFs were able to explore their educational interests through creating the booklet. While Kingsley took charge of writing compelling, scientifically accurate copy about Rhode Island’s flora, Lahlaf put her creative juices to work by organizing the book’s plant images and developing salt marsh illustrations. “I love to read and write, it is really as simple as that,” adds Kingsley. Although Kingsley Lahlaf are unsure of what they will do after graduation, the SURFs have produced an informative and visually compelling product, the fruit of a successful 10-week partnership. “We did everything collaboratively, which was an awesome experience,” says Lahlaf as Kingsley laughs in agreement. The University of Rhode Island, commonly referred to as URI, is the flagship public research as well as the land grant and sea grant university for the state of Rhode Island. Its main campus is located in the village of Kingston in southern Rhode Island. Additionally, smaller campuses include the Feinstein Campus in Providence, the Rhode Island Nursing Education Center in Providence, the Narragansett Bay Campus in Narragansett, and the W. Alton Jones Campus in West Greenwich. 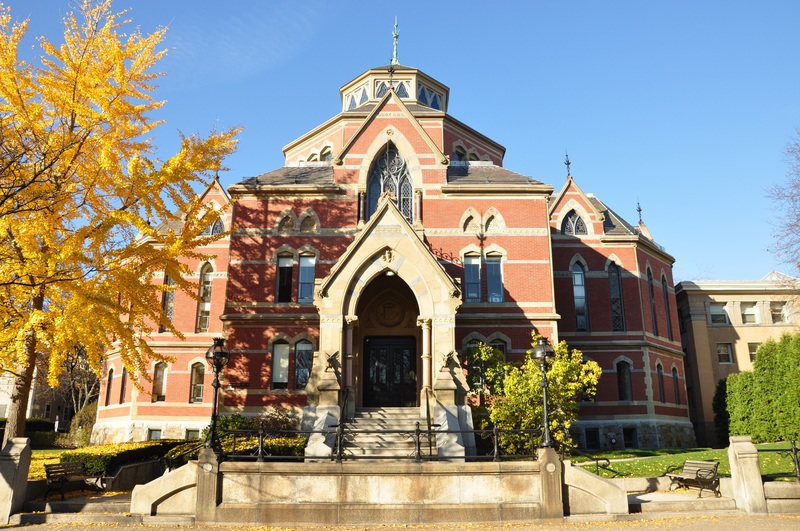 The university offers bachelor’s degrees, master’s degrees, and doctoral degrees in 80 undergraduate and 49 graduate areas of study through eight academic colleges. These colleges include Arts and Sciences, Business Administration, Education and Professional Studies, Engineering, Health Sciences, Environment and Life Sciences, Nursing and Pharmacy. Another college, University College for Academic Success, serves primarily as an advising college for all incoming undergraduates and follows them through their first two years of enrollment at URI. The University enrolled about 13,600 undergraduate and 3,000 graduate students in Fall 2015. U.S. News & World Report classifies URI as a tier 1 national university, ranking it tied for 161st in the U.S.
Meenakshi Narain will lead the collaboration board for U.S. institutions participating the CMS experiment at the Large Hadron Collider, an experiment pushing the frontiers of modern particle physics. Brown University physics professor Meenakshi Narain has been tapped to chair the collaboration board of U.S. institutions in the Compact Muon Solenoid (CMS) experiment, one of two large-scale experiments happening at the Large Hadron Collider particle accelerator headquartered in Geneva. The CMS experiment is an international collaboration of 4,000 particle physicists, engineers, computer scientists, technicians and students from approximately 200 institutes and universities around the world. With more than 1,200 participants, the U.S. CMS collaboration is the largest national group in the global experiment. As collaboration board chair, Narain will represent U.S. institutions within the broader collaboration, as well as with U.S. funding agencies. The board also plays a key role in shaping the vision and direction of the U.S. collaboration. Narain and other Brown physicists working with the CMS experiment played key roles in the discovery in 2012 of the Higgs Boson, which at the time was the final missing piece in the Standard Model of particle physics. After the Higgs, the CMS experiment has been searching for particles beyond the Standard Model, including a potential candidate particle for dark matter, the mysterious stuff thought to account for a majority of matter in the universe. Narain says part of her job is to maintain the research synergy created by the numerous U.S. scientists and institutions involved in the collaboration as they analyze data from the collider’s latest run. At the same time, the experiment must also prepare for the next stage of the Large Hadron Collider program slated to start around 2026. The next stage involves beam intensities five times higher the current level and 10 times more data than has been acquired to date. That will require parts of the CMS detector to be rebuilt. Narain says that as the first woman to chair the collaboration board, she plans to work toward cultivating more diversity in what is currently the largest physics collaboration in the U.S.
Narain joined the Brown faculty in 2007 and has worked at the Large Hadron Collider together with the Brown team that includes professors David Cutts, Ulrich Heintz and Greg Landsberg. She was also a member of the DZero experiment at the Fermi National Accelerator Laboratory, where she played a prominent role in the discoveries of the top quark and the anti-top quark, two fundamental constituents of matter. She is a fellow of the American Physical Society and the author of more than 500 journal articles. Quantum heat. An image of the experimental setup used to produce evidence of strange quasi-particles called non-Abelian anyons. A new measurement of heat conduction in an exotic state of matter points to the presence of strange particles that could be useful in quantum computers. In a paper published this week in the journal Nature, a research team including a Brown University physicist has characterized how heat is conducted in a matter state known as a quantum Hall liquid, in which electrons are confined to two dimensions. The findings suggest the presence of non-Abelian anyons, quantum quasi-particles that retain a “memory” of their relative positions in the past. Theorists have suggested that the ability of these particles to retain information could be useful in developing ultra-fast quantum computing systems that don’t require error correction, which is a major stumbling block in the development of quantum computers. The research was led by an experimental group at the Weizmann Institute of Science in Rehovot, Israel. Dmitri Feldman, a professor of physics at Brown, was part of the research group. He discussed the findings in an interview. Q: Could you explain more about what you and your colleagues found? A: We were looking at thermal conductance — which simply means the flow of heat from a higher temperature to a lower temperature — in what’s known as a 5/2 quantum Hall liquid. Quantum Hall liquids are not ‘liquids’ in the conventional sense of the word. The term refers to the behavior of electrons inside certain materials when the electrons become confined in two dimensions in a strong magnetic field. What we found was that the quantized heat conductance — meaning a fundamental unit of conductance — in this system is fractional. In other words, the value was not an integer, and that has interesting implications for what’s happening in the system. When the quantum thermal conductance is not an integer, it means that quasi-particles known as non-Abelian anyons are present in this system. Q: Can you explain more about non-Abelian anyons? A: In the Standard Model of particle physics, there are only two categories of particles: fermions and bosons. That’s all there is in the world we experience on a daily basis. But in two-dimensional systems like quantum Hall liquids, there can be other types of particles known as anyons. Generally speaking, there are two types of anyons: Abelian anyons and non-Abelian anyons. Abelian anyons behave more or less like conventional fermions, but non-Abelian anyons are, for lack of a better way of saying it, completely insane. They have very strange properties that could be used in quantum computing, or more specifically, for what’s known as topological quantum memory. Q: What’s the connection between non-Abelian anyons and quantum computing? A: A regular quantum computer — one without non-Abelian anyons — would require error correction. For one useful quantum bit of information, you need multiple additional quantum bits to correct errors that arise from random fluctuations in the system. That’s extremely demanding and a big problem in quantum computing. But topological quantum computing — which requires the presence of non-Abelian anyons — is unique in that it doesn’t need error correction to make the quantum bits useful. That’s because in a non-Abelian system, you can produce states that are completely indistinguishable locally, but globally the states are completely different. So you can have random perturbations of these local quantum numbers, but it won’t change the global quantum numbers, which means the information is safe. Q: Where does this line of research go from here? A: This work suggests that a particular entity known as a Majorana particle is at work in the particular system that we studied. And that suggests that a Majorana-based quantum computer is possible. But an even more powerful computational platform would come from what’s known as parafermions, which have been theorized but not yet shown to exist. Perhaps their existence could also be proven with similar experimental tools in the future. Tags: Applied Research & Technology ( 5,458 ), Brown University, Earth Observation ( 456 ), Experiments using a high-powered projectile cannon show how impacts by water-rich asteroids can deliver surprising amounts of water to planetary bodies, The findings could have significant implications for understanding the presence of water on Earth, The origin and transportation of water and volatiles is one of the big questions in planetary science, Water delivered to Earth by steroids? Special delivery. Experiments using a high-powered projectile cannon suggest that asteroids can deliver surprising amounts of water when they smash into planetary bodies. New research shows that a surprising amount of water survives simulated asteroid impacts, a finding that may help explain how asteroids deposit water throughout the solar system. Experiments using a high-powered projectile cannon show how impacts by water-rich asteroids can deliver surprising amounts of water to planetary bodies. The research, by scientists from Brown University, could shed light on how water got to the early Earth and help account for some trace water detections on the Moon and elsewhere. The source of Earth’s water remains something of a mystery. It was long thought that the planets of the inner solar system formed bone dry and that water was delivered later by icy comet impacts. While that idea remains a possibility, isotopic measurements have shown that Earth’s water is similar to water bound up in carbonaceous asteroids. That suggests asteroids could also have been a source for Earth’s water, but how such delivery might have worked isn’t well understood. Hypervelocity impact experiments, like the one shown here, reveal key clues about how impacts deliver water to asteroids, moons, and planets. In this experiment, a water-rich impactor collides with a bone-dry pumice target at around 11,200 miles per hour. 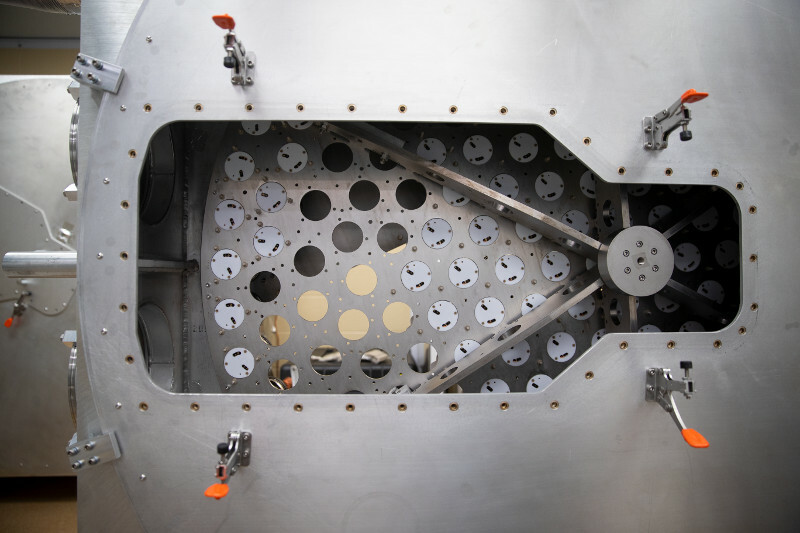 The target was designed to rupture partway through the experiment in order to capture materials for analysis. This high-speed video, taken at 130,000 frames per second, slows down the action, which in real time is over in less than a second. For the study, Daly and Schultz used marble-sized projectiles with a composition similar to carbonaceous chondrites, meteorites derived from ancient, water-rich asteroids. Using the Vertical Gun Range at the NASA Ames Research Center, the projectiles were blasted at a bone-dry target material made of pumice powder at speeds around 5 kilometers per second (more than 11,000 miles per hour). The researchers then analyzed the post-impact debris with an armada of analytical tools, looking for signs of any water trapped within it. They found that at impact speeds and angles common throughout the solar system, as much as 30 percent of the water indigenous in the impactor was trapped in post-impact debris. Most of that water was trapped in impact melt, rock that’s melted by the heat of the impact and then re-solidifies as it cools, and in impact breccias, rocks made of a mish-mash of impact debris welded together by the heat of the impact. The research gives some clues about the mechanism through which the water was retained. As parts of the impactor are destroyed by the heat of the collision, a vapor plume forms that includes water that was inside the impactor. Samples of impact glasses created during an impact experiment. In impact experiments, these glasses capture surprisingly large amounts of water delivered by water-rich, asteroid-like impactors. The findings could have significant implications for understanding the presence of water on Earth. Carbonaceous asteroids are thought to be some of the earliest objects in the solar system — the primordial boulders from which the planets were built. As these water-rich asteroids bashed into the still-forming Earth, it’s possible that a process similar to what Daly and Schultz found enabled water to be incorporated in the planet’s formation process, they say. Such a process could also help explain the presence of water within the Moon’s mantle, as research has suggested that lunar water has an asteroid origin as well. The work could also explain later water activity in the solar system. Water found on the Moon’s surface in the rays of the crater Tycho could have been derived from the Tycho impactor, Schultz says. Asteroid-derived water might also account for ice deposits detected in the polar regions of Mercury. The research was supported by NASA (NNX13AB75G), the National Science Foundation (DGE-1058262) and the NASA Rhode Island Space Grant (NNX15AI06H). A new $100 million gift to Brown University’s brain science institute from alumnus Robert J. Carney and Nancy D. Carney will drive an ambitious agenda to quicken the pace of scientific discovery and help find cures to some of the world’s most persistent and devastating diseases, such as ALS and Alzheimer’s. Carney graduated in Brown’s undergraduate Class of 1961, is a long-serving Brown trustee, and is founder and chairman of Vacation Publications Inc. Previously, he was a founder of Jet Capital Corp., a financial advisory firm, and Texas Air Corp., which owned Continental Airlines and several other airlines. Nancy Doerr Carney is a former television news producer. The Carneys’ gift changes the name of the Brown Institute for Brain Science to the Robert J. and Nancy D. Carney Institute for Brain Science, and establishes the institute as one of the best-endowed university brain institutes in the country. Brown President Christina Paxson said the $100 million donation — one of the largest single gifts in Brown’s history — will help establish the University as a leader in devising treatments and technologies to address brain-related disease and injury. The gift will allow the Carney Institute to accelerate hiring of leading faculty and postdoctoral scholars in fields related to brain science, supply seed funding for high-impact new research, and also fund essential new equipment and infrastructure in technology-intensive areas of exploration. 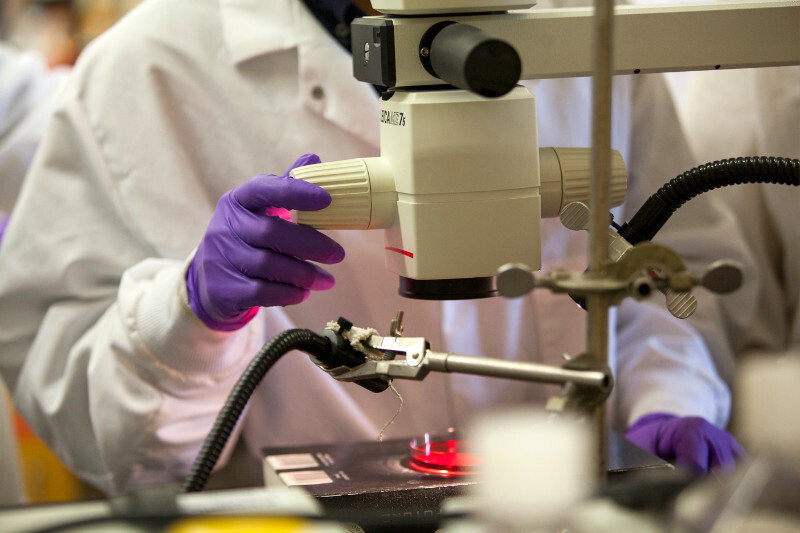 Core areas of research at the institute include work on brain-computer interfaces to aid patients with spinal injury and paralysis; innovative advances in computational neuroscience to address behavior and mood disorders; and research into mechanisms of cell death as part of efforts to identify therapies for neurodegenerative diseases that include amyotrophic lateral sclerosis (ALS) and Alzheimer’s. Carney said he is excited that he and his wife are making their gift at a time when brain science has emerged as one of the fastest growing programs at Brown, both in terms of research and student interest. VIDEO: Brain Science at Brown. No video credit. With up to 45 labs across campus engaged in research at any given time — and 130 affiliated professors in departments ranging from neurology and neurosurgery to engineering and computer science — Brown’s brain science institute already has built a reputation for studying the brain at all scales, said Diane Lipscombe, the director of the institute since 2016 and a professor of neuroscience. From studying genes and circuits, to healthy behavior and psychiatric disorder, the institute’s faculty contribute expertise to routinely produce insights and tools to see, map, understand and fix problems in the nervous system. In addition, as the brain institute’s work grows in its breadth, undergraduates continue to take on key roles as researchers, reflecting a distinctive aspect of Brown’s undergraduate curriculum. About a quarter of all Brown undergraduates take Introduction to Neuroscience, demonstrating the excitement in the field. Investments like the gift from the Carneys are the “lifeblood to driving innovation and discovery,” Lipscombe said. The Carneys’ gift is part of Brown University’s $3-billion BrownTogether comprehensive campaign, which has raised $1.7 billion to date. In total, $148 million has been raised to support research and education in brain science. The gifts support one of the core research priorities defined in Brown’s Building on Distinction strategic plan: understanding the human brain. The study of the brain and its relationship to cognition, behavior and disease is often described as the “last frontier” in biomedical science. The Carney Institute had its start at Brown as the Brain Science Program in 1999, later becoming the Brown Institute for Brain Science. The scope of its work has increased dramatically in recent years, and the institute now has affiliated faculty spanning 19 academic departments, including clinical departments in the Warren Alpert Medical School. Since 2011, core faculty members have led projects with more than $116 million in grant funding from federal and other sources. Many of the institute’s researchers have been recognized as pioneering leaders, winning top national awards in recent years. This includes faculty such as Eric Morrow, associate professor of biology and psychiatry, a 2017 winner of a Presidential Early Career Award for Scientists and Engineers. We asked researchers at Brown what excites them about brain science, why they chose to conduct research here, and how Brown’s unique approach to collaborative problem-solving is unlocking and explaining the complexity of the brain. 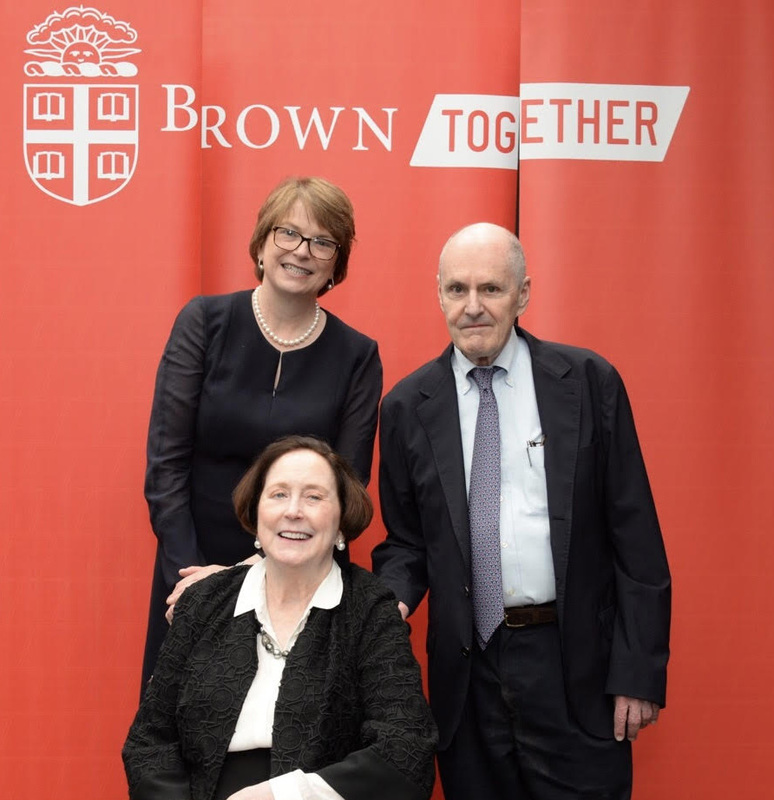 The funding from the Carneys’ gift will help support what has become a signature program of Brown’s brain institute over the past decade: cutting-edge efforts to help those who have lost the ability to move and communicate through paralysis to regain those abilities. Research into brain-computer interfaces, part of the BrainGate project, uses tiny micro-electrode arrays implanted into the brain. The study of neurodegenerative diseases and the growing research field of computational neuroscience are among the other areas in the institute that are poised for further expansion. Computational neuroscience is an increasingly influential field that employs mathematical models to understand the brain and develops quantitative approaches to diagnosing and treating complex brain disorders. Scientists working in computational psychiatry at Brown are thinking about how they can use their work modeling the brain to address psychiatric disease, such as depression. A new technology called “trans-Tango” allows scientists to exploit the connections between pairs of neurons to make discoveries in neuroscience. 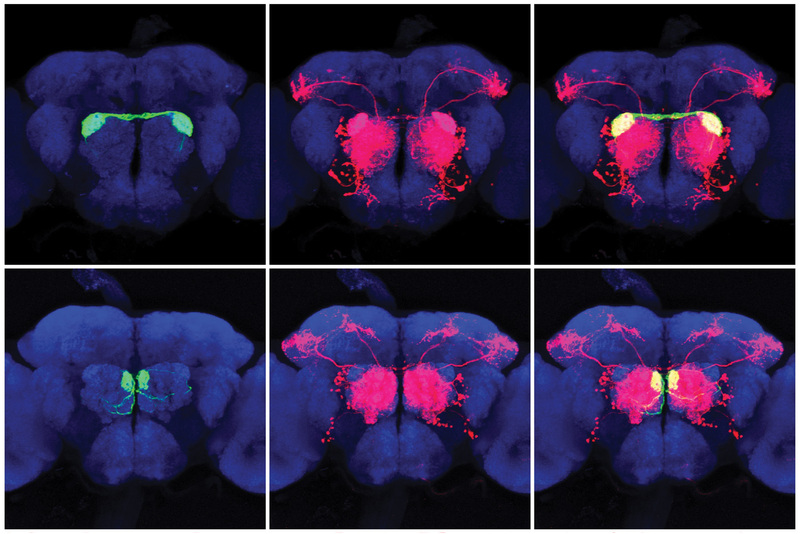 Developing the system required decades of work and a dedicated team of brain scientists at Brown. No image credit. The Carney Institute will move into expanded new quarters at 164 Angell Street early next year, after extensive renovation of the building that formerly housed Brown administrative offices. The building will give the institute state-of-the-art shared lab spaces that will further promote collaboration among teams from cognitive neuroscience, computational neuroscience and neuroengineering. These scientists are working on processes such as decoding neural signals, developing new ways to use neural signals in assistive technology, and mining neural data for more accurate predictors of psychiatric illnesses. The new location will be in the same building as Brown’s Data Science Initiative and directly across the street from the new home of Brown’s Jonathan M. Nelson Center for Entrepreneurship, stimulating opportunities for collective work that will support discoveries and their impact on society. The gift from the Carneys is one of three single gifts of $100 million to Brown in its 254-year history. Brown announced in 2004 that New York businessman Sidney E. Frank, a member of the Brown Class of 1942, had pledged $100 million for undergraduate financial aid. A $100 million gift from the Warren Alpert Foundation announced by Brown in 2007 funded research, faculty recruitment, a new building and named Brown’s Warren Alpert Medical School. Brown President Christina Paxson (standing, left) joined Robert J. Carney and Nancy D. Carney to celebrate the couple’s generous gift at an event in Houston on April 18. No image credit. The Carneys said they were inspired to make their gift by many previous positive experiences with Brown, as well as the opportunities they saw for the University in brain science. The Carneys, of Houston, are long-time supporters of Brown, including as the donors of two endowed professorships — the Robert J. and Nancy D. Carney University Professor of Economics and the Robert J. and Nancy D. Carney Assistant Professor of Neuroscience. This spring, Carney will finish his third term as a trustee on the Corporation of Brown University. His volunteerism includes having served as the co-chair of the 50th reunion gift committee for the Class of 1961. As part of a celebration in Houston coinciding with the announcement of the Carneys’ gift to the brain science institute, Paxson on behalf of the University conferred honorary Doctor of Humane Letters degrees on both of the Carneys. 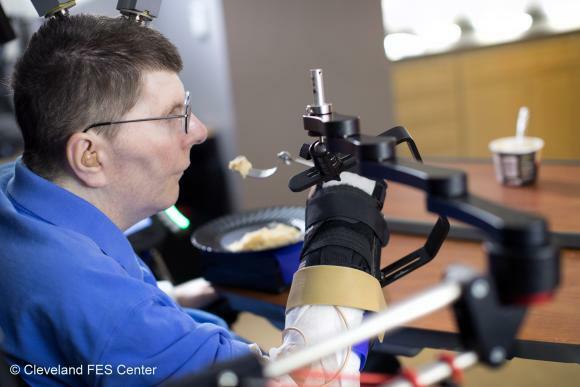 After implantation with the BrainGate brain-computer interface (which originated in a Brown research laboratory) and stimulative electrodes in his arm, a Cleveland man with quadriplegia was able to again move his arm to eat and drink. Cleveland FES Center. “I grew up in Rhode Island. I am always thrilled when Providence makes it onto a list of the top five hippest cities or our beaches are singled out as the most beautiful in the world. The other day, though, Little Rhody made it onto a Top Five list of more dubious distinction: a national survey of 65,000 physicians showed that Providence-area women physicians have the fourth-largest gender wage gap in the nation — at a whopping 31 percent difference between men and women — and the fifth-lowest average salary for female physicians. Translated into dollars and cents, this means that a woman physician in Rhode Island earns about $110,000 less per year than her male counterparts. Added up over the course of a career, the compensation difference is staggering. Many possible explanations for the lack of gender equity in physician compensation have been put forth. One hypothesis is that male physicians are in higher-paying specialties than women. The data, however, do not support this explanation. Indeed, although women in more lucrative specialties have higher salaries than the average women physician’s salary, the gap is even wider in higher paying specialties. Perhaps then, male physicians have higher salaries because they do a better job than women? Again, the data do not support this explanation. A 2017 study in the Journal of the American Medical Association Internal Medicine showed that patients who were cared for by women physicians had lower death rates and were less likely to be readmitted to the hospital than patients treated by a male physician. Finally, there is a theory that women don’t get raises because they simply do not ask. Once again, the data do not bear this out. A 2017 study of 70,000 people by LeanIn.Org and McKinsey & Co showed that women do ask, but they are denied more frequently than men and are viewed more negatively after broaching the issue of a raise. Some may wonder why this issue matters, and here the data are clear. Paying women less hurts working families and perpetuates the structural sexism and racism that has advantaged men and white people across occupations and industries for generations. Men who accept this gap in compensation for their female colleagues are complicit in prolonging these inequities. What can be done? First, both male and female physicians must demand transparency with regard to salaries. Until we break the taboo of discussing money, and pay gap information is examined in the light of day, we cannot come up with solutions to divide the pot more equally. Katherine M. Sharkey, M.D., is associate professor of medicine and psychiatry and human behavior, and assistant dean for women in medicine and science at Alpert Medical School of Brown University. A class of materials called perovskites has emerged as a promising alternative to silicon for making inexpensive and efficient solar cells. But for all their promise, perovskites are not without their downsides. Most contain lead, which is highly toxic, and include organic materials that are not particularly stable when exposed to the environment. Now a group of researchers at Brown University and University of Nebraska – Lincoln (UNL) has come up with a new titanium-based material for making lead-free, inorganic perovskite solar cells. In a paper published in the journal Joule (a new energy-focused sister journal to Cell), the researchers show that the material can be a good candidate, especially for making tandem solar cells — arrangements in which a perovskite cells are placed on top of silicon or another established material to boost the overall efficiency. Interest in perovskites, a class of materials with a particular crystalline structure, for clean energy emerged in 2009, when they were shown to be able to convert sunlight into electricity. The first perovskite solar cells had a conversion efficiency of only about 4 percent, but that has quickly skyrocketed to near 23 percent, which rivals traditional silicon cells. And perovskites offer some intriguing advantages. They’re potentially cheaper to make than silicon cells, and they can be partially transparent, enabling new technologies like windows that generate electricity. The team made semi-transparent perovskite films that had bandgap — a measure of the energy level of photons the material can absorb — of 1.8 electron volts, which is considered to be ideal for tandem solar applications. The material had a conversion efficiency of 3.3 percent, which is well below that of lead-based cells, but a good start for an all-new material, the researchers say. 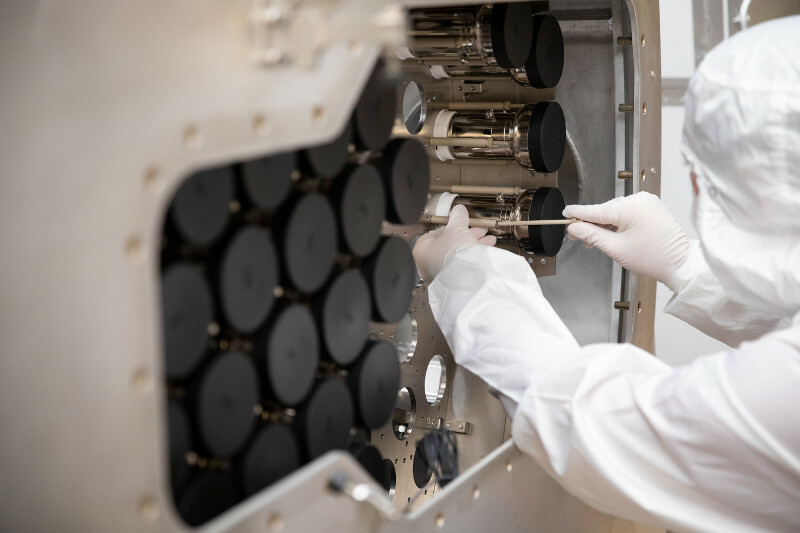 Min Chen, a Ph.D. student of materials science at Brown and the first author of the paper, used a high-temperature evaporation method to prepare the films, but says the team is investigating alternative methods. “We are also looking for new low-temperature and solvent-based methods to reduce the potential cost of cell fabrication,” he said. The research showed the material has several advantages over other lead-free perovskite alternatives. One contender for a lead-free perovskite is a material made largely from tin, which rusts easily when exposed to the environment. Titanium, on the hand, is rust-resistant. The titanium-perovskite also has an open-circuit voltage — a measure of the total voltage available from a solar cell — of over one volt. Other lead-free perovskites generally produce voltage smaller than 0.6 volts. The researchers say that material’s relatively large bandgap compared to silicon makes it a prime candidate to serve as the top layer in a tandem solar cell. The titanium-perovskite upper layer would absorb the higher-energy photons from the sun that the lower silicon layer can’t absorb because of its smaller bandgap. Meanwhile, lower energy photons would pass through the semi-transparent upper layer to be absorbed by the silicon, thereby increasing the cell’s total absorption capacity. Other co-authors on the paper were Ming-Gang Ju, Alexander Carl, Yingxia Zong, Ronald Grimm, Jiajun Gu and Xiao Cheng Zeng. The research was supported by the National Science Foundation (OIA-1538893, DMR-1420645).